If we believe Coco Chanel’s statement above, I guess we think the category of “best things” is probably pretty small; and the reality is that most of the things we want fall into the category of ‘second best': very, very expensive. That’s probably why we so quickly learn “You get what you pay for” – why we end up working so hard to make as much money as possible, why credit cards get maxed out and debts are constantly growing. And it’s probably why the last few episodes in Jesus’ life were so shocking. Because when we discover that even the best of the best hasn’t ‘paid enough’ to get into heaven, we’re left with a rather troubling question. If “You get what you pay for” and the best isn’t enough, who can get in? SAM: How is it that you, a Jew, ask for a drink from me, a woman of Samaria? After a chapter and a half of people being told “no entry”, we get this beautiful offer: eternal, satisfying life. Compared to an ever-flowing stream, such an offer is profoundly appealing – especially in a society where the nearest water source required an exhausting journey by foot in the midday sun. Jesus was offering her eternal life. JESUS: Go, call your husband and come here. JESUS: You are right in saying, ‘I have no husband'; for you have had five husbands, and the one you now have is not your husband. What you have said is true. Put yourself in the shoes of someone who was around at the time of Jesus. “The Kingdom of God” was reserved for righteous, male Jews. I’m not going to defend that position; that’s simply the situation. And yet here we have a Samaritan (non-Jewish) woman, arriving at a well in the middle of the day with a history of promiscuity hanging over her. It’s even possible that such serial adultery had left her as a social pariah – which required her to visit the well at a time when no one else was around. And yet it was to her that Jesus made this offer. It was on her life that Jesus shone His light 1, and intriguingly she stepped into it. Though her shame was exposed, she was willing to be illuminated and to come to Jesus. And she responded with those wonderful words, “Sir, give me this water” (v15), “I know that Messiah is coming” (v25), “Come, see a man who told me all that I ever did. Can this be the Christ?” (v29). She is the one who came into the light, who heard, who believed. 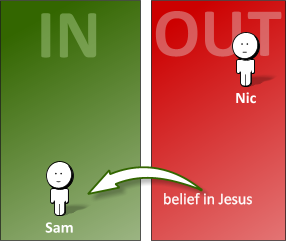 The inclusion of someone as shunned and disregarded as Samantha is meant to leave us shocked and appalled – why is Nicodemus excluded while Sam is allowed in? How can that possibly be the case? It’s these verses that seem to be in view in John 4:31-38. 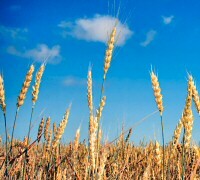 Jesus, as He explained what was going on, said that harvest time had come. In fact, the time had come for the kind of abundant harvest where the guy bringing in the produce is overtaking the one who is sowing it! It’s a scientifically impossible image, but gives the sense of abundance that Amos was talking about. The gates are open wide. Everyone can come in. And so that includes people like this Samaritan woman. Indeed, by the end of the chapter we see the whole of the local village coming out to meet Jesus. ‘The fields are white for harvest’ (v35) seems to refer to this crowd of Samaritan villagers flocking to see “the Saviour of the world” (v42). Jesus held up a “No entry” sign to the person who refused to come to Him. But to anyone who believes – literally anyone – Jesus welcomes with open arms. Harvest time has come. If you’re reading this and you’re not a Christian, then my encouragement to you is to accept this incredible offer. Jesus genuinely offers eternal life – and it’s as simple as believing in Him5. It’s the satisfying experience of taking living water that always flows – of relationship with the Creator God as His children6. And it’s absolutely freely available to anyone – whoever you are, whatever you have done. But my guess is that most people reading this are already Christians. So the question is, why do we need to know this? Why does John’s account include it? It would be easy to apply this with “Go and tell people about Jesus!” If the gates are open wide, if harvest time has come, then an obvious application is to tell people about it. That absolutely wouldn’t be a wrong thing to do. But I think the more direct application in John’s mind was a recognition of how widely the gates have been opened. It’s not so much “Go and tell people about Jesus!” but “Stop restricting access.” Not “Point to the door!” but “Stop holding it shut.” We have a habit of keeping people out of Jesus’ kingdom – assuming they’re too bad, or too resistant. On the flip side, we can think that people are only in because they’re ‘good people’. Even as those who know the message of Jesus, we can slip into those mistakes. Jesus won’t have any of it. He held up a no-entry sign to the one we expected to come in. Good works were never the way in. The way in is belief – and it’s open for anyone to walk through. Stop holding the door shut. Jesus has flung it wide open. Harvest time has come.